I’ve been thinking and wondering about you ever since those first days. I was so glad when I heard you were safe early on, but hearing the whole first-hand account is unreal. So glad you and your friends and neighbors are OK; so many of us Nepal lovers are worried about the country and its recovery. Keep us posted as you finish out your time there. Thanks for your thoughts. Nepal had huge problems before this quake. It so desperately needs the aid to go to the people that need it, but the first-hand accounts I am hearing make me afraid. I was enjoying some revisits to the different heritage sites in and around the city as I realised that I may not be able to come back to many of them. Hence the little videos. Now, I can’t believe that so much of them have gone. I wanted to go to Bhaktapur the weekend before the quake but was too busy. Now much of it is rubble. We’re all still trying to process it. Your story made me shiver but so glad you are safe! My God-daughter was on a climb near Everest, and is ok, but a British friend of my daughter’s is still missing. So traumatic, so sad. I look forward to seeing you in Spetses this summer. Thanks Dianna. So many sad stories. I hope your daughter’s friend is ok. We will be in Spetses mid-July to mid-August. Hope to see you then. OH MY GOD!! What a terrifying experience, I can’t even begin to imagine! I’m so glad you are OK! Thank you for this vivid account of your experience. Sending love to both of you and to the people of Kathmandu. Thanks Claudia. The country is going to need all the support it can get. I’ve been following your blog for a bit, but I don’t think we’ve ever exchanged comments before – good to know your loved ones and you’ve come out safely from this very scary experience. Reading your first hand experience makes one realize how unpredictable life is. Wishing you safe times ahead. Thanks for taking the time to comment. Its so amazing that everyone I know is ok. The fact that the earthquake happened on a Saturday (day off) and during the day, went a long way to preventing an even bigger tragedy. Thank God for that. The extent of loss that some people would be going through there is unimaginable for most of us. Thanks for taking the time to comment. I know what you mean. Its devastating in a country that had so many problems before the quake. 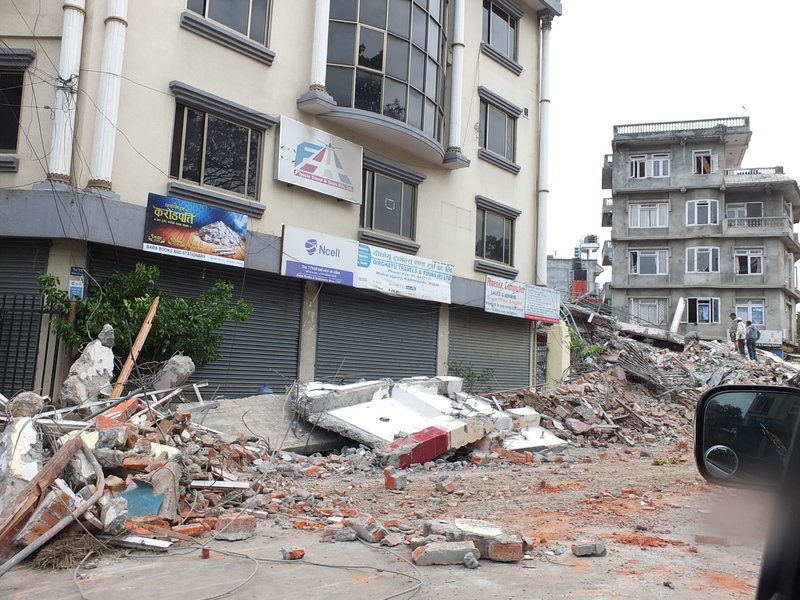 Gorkha is flattened. Pokhara is still pretty intact. Wow, Caroline. I’m so glad you are safe. I was reading your post in utter disbelief and getting goosebumps. I’ll continue to send prayers to everyone there in Nepal. Wow, Caroline. I read this post in utter disbelief. I’m glad to hear the you’re safe. I will continue my prayers for Nepal. I am so glad you and Robert are all right. Stay safe and lots of prayers for you guys. We are all thinking of you. Thanks for the up date. Thanks Wendy. I just talked to June yesterday. Hopefully we can see you both when we are in the PA area in mid-August. Love to you all. I’ve been thinking about you since it happened, wondering if you came through it or not. Life is so fragile, and everything can change in a heartbeat. It must have been a frightening experience. It’s so good to hear you are both okay. So much devastation and heartbreak. I’ve just been writing about the Christchurch earthquake, which pales in comparison, but the heartbreak is the same. And the way difficult circumstances seem to bring out the best in people is also the same. Thank you for the update. Alison – thanks for your thoughts. Everything you say is so true and the fragility of everything is probably at the forefront of everyone’s minds. I know it is on mine. I’ve just read through your account of your experience of the earthquake. It’s very well written, Caroline. I was here in Europe when the earthquake struck but the funny thing is that I wanted to be there as soon as I heard. I told everybody that our homes were not damaged. This has turned out not to be true and all homes are damaged. I guess the family didn’t want to get us too worried so we would be dashing back to Kathmandu. Sorry to hear that. We are just started to assess what “damaged” means with different properties. Can they be fixed? Is the damage cosmetic? Or are the unsalvageable. .. I hope yours don’t take took much to put right. So glad to hear that you and your family are well, I just can’t imagine how terrifying that earthquake must have been. I know KTM pretty well for having been there 7 or 8 times, when I was there last year I had quite a long discussion with my guide about the possibility of of an earthquake especially after noticing new buildings going up that just weren’t in their place. Wishing all the best for the 2 months that are left for your stay in KTM. I know, its very worrying not knowing. However, telecommmunications have not been good, people may simply be displaced or living outside. (The tent villages are smaller now but many, many people are still homeless.) I was at the Kaiser Library (next to the garden of dreams) yesterday looking at the damage. That beautiful old library is in a bad state. So many similar stories. Thanks for your kind thoughts. Thanks so much for telling us your story. Best wishes to everyone in Nepal. I am at a loss for words reading your experience, all I can say is thank goodness you are okay. It looks like when you leave Nepal, I will be coming to Nepal (only for a couple of weeks though). A group from my church had plans to go before the earthquake hit and we are still planning on coming later this summer. Is there any way I can be praying for you or for the area before I get to Kathmandu? Thanks. Nepal may not be a good place to visit for a while. Keep checking the Embassy website home page for travel advisories. http://nepal.usembassy.gov/ Right now it is not recommended for non-essential travel: http://nepal.usembassy.gov/sm42715.html and may be that way for a while. So much infrastructure has been damaged. Anyway, thank you for your kind thoughts and I hope your trip can go ahead as planned. My name is Joe Pinzone and I’m casting an international travel show about expats moving abroad. We’d love to film in Nepal and wanted to know if you could help us find expats who have moved there within the last 15 months or have been there for 3-4 years, but recently moved into a new home. The show documents their move to a new country and will place the country in nice light. The contributors on the show would also receive monetary compensation if they are filmed. If you’d like more information, please give me a call at 212-231-7716 or skype me at joefromnyc. You can also email me at joepinzone@leopardusa.com. Looking forward to hearing from you. Sorry, Joe. Not a good time. I’m relieved to hear that you’re safe and doing ok. You’re right that now the news on the earthquake have become secondary news. There are just too many things going on in the world that it’s impossible to capture everyone’s attention on everything and anything. Best wishes to Nepal and the Nepali people – they are tough, strong and resilient – despite losing their possessions and unfortunately, for some, their loved ones – I’m sure they will come out of this tragedy with triumph. There are no words to say how relieved I am to read you are ok, and how sad/concerned I feel about all who are affected by the catastrophic seismic activity. Do you have a recommendation for making a donation to help with recovery?